Below you fill find all funeral homes and cemeteries in or near Passaic. 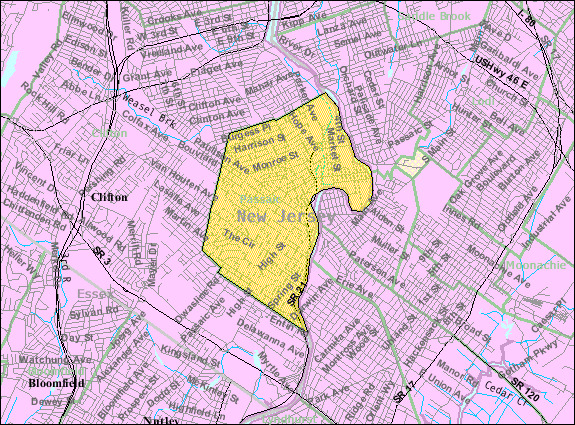 Popular neighborhoods in Passaic include: New York metropolitan area. Suburbs of Passaic: Dundee, Passaic Park. 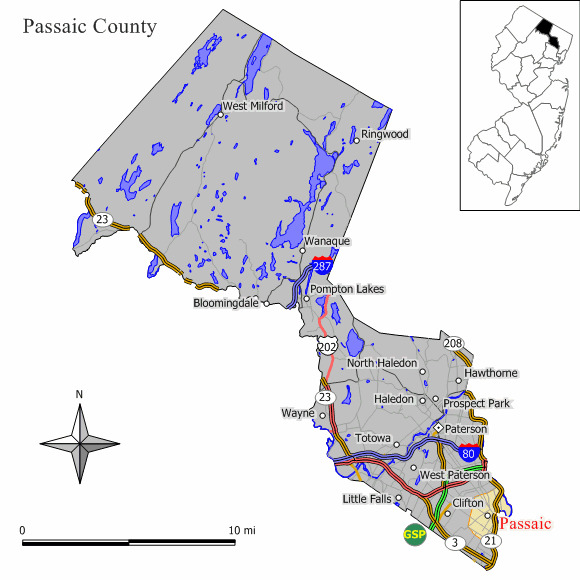 Passaic is also known as: Passaic County / Passaic city. Their current mayor is Mayor Amada Curling. Zip codes in the city: 07055. Some of the notable people born here have been: Paul Rudd (actor and comedian), Alan Rosenberg (actor), Craig Heyward (american football player), Tyronne Stowe (american football player), Michael Marisi Ornstein (actor and painter), Reed Gusciora (lawyer and politician), and Mitch Albom (novelist and musician). Passaic (/pəˈseɪ.ɨk/ pə-SAY-ik or local /pəˈseɪk/ pə-SAYK) is a city in Passaic County, New Jersey, United States. As of the 2010 United States Census, the city had a total population of 69,781, maintaining its status as the 15th largest municipality in New Jersey with an increase of 1,920 residents (+2.8%) from the 2000 Census population of 67,861, which had in turn increased by 9,820 (+16.9%) from the 58,041 counted in the 1990 Census.Located north of Newark on the Passaic River, it was first settled in 1678 by Dutch traders, as Acquackanonk Township. The city and river draw their name from the Lenape word "pahsayèk" which has been variously attributed to mean "valley" or "place where the land splits." It was written on January 1st, 2019 that Alan F Grip passed on in Frederick, Maryland. Grip was 82 years old and was born in Passaic, NJ. Send flowers to share your condolences and honor Alan F's life. It was disclosed by New Haven Register on September 9th, 2018 that Walter H Schenck perished in Connecticut. Schenck was 77 years old and was born in Passaic, NJ. Send flowers to express your sorrow and honor Walter H's life. It was noted by Sarasota Herald-Tribune on August 18th, 2018 that Lorraine Marie Cupo (McKay) perished in Sarasota, Florida. Ms. Cupo was 75 years old and was born in Passaic, NJ. Send flowers to express your sympathy and honor Lorraine Marie's life. It was written by Sarasota Herald-Tribune on June 26th, 2018 that Robert Trommel Gaston passed on in Lakewood Ranch, Florida. Gaston was 78 years old and was born in Passaic, NJ. Send flowers to express your sympathy and honor Robert Trommel's life. It was written by Sarasota Herald-Tribune on May 25th, 2018 that John Joseph Sr Locrasto passed away in Lakewood Ranch, Florida. Locrasto was 93 years old and was born in Passaic, NJ. Send flowers to express your sorrow and honor John Joseph Sr's life. It was noted by Sarasota Herald-Tribune on April 14th, 2018 that Jeanne R Peck perished in Venice, Florida. Peck was 100 years old and was born in Passaic, NJ. Send flowers to share your condolences and honor Jeanne R's life. It was revealed by Sarasota Herald-Tribune on April 11th, 2018 that John Joseph Jr "Jack" Dulmer passed on in Venice, Florida. Dulmer was 70 years old and was born in Passaic, NJ. Send flowers to share your condolences and honor John Joseph Jr "Jack"'s life. It was written by The Villages Daily Sun on April 6th, 2018 that Barry Edmond Packar passed on in The Villages, Florida. Packar was 75 years old and was born in Passaic, NJ. Send flowers to share your condolences and honor Barry Edmond's life. It was disclosed on March 27th, 2018 that Robert John "Bob" Dunham died in Gulf Breeze, Florida. Dunham was 69 years old and was born in Passaic, NJ. Send flowers to express your sympathy and honor Robert John "Bob"'s life. It was revealed by San Diego Union-Tribune on March 25th, 2018 that Julius "Jules" Hertz died in San Diego, California. Hertz was 88 years old and was born in Passaic, NJ. Send flowers to express your sorrow and honor Julius "Jules"'s life. Located north of Newark, New Jersey on the Passaic River, it was first settled in 1678 by Netherlands traders, as Acquackanonk Township, New Jersey Township. In 1931, experimental television station W2XCD began transmitting from Lee De Forest Radio Corp. It has been called the first television station to transmit to the home, and was the first such station to broadcast a feature film. DuMont later started the DuMont Television Network, the world's first commercial television network, in 1946. 210. A famous strike in 1926 against reductions in wages involved the Freedom of assembly of free assembly. The official website for the city of Passaic is http://www.cityofpassaic.com/. Listing all funeral homes in Passaic, New Jersey so you can easily send flowers to any location (same day delivery) or find any funeral service. Find embalmers & Embalmers in Passaic, NJ. Read business reviews, find driving directions, and more. embalmers on YP.COM. We work with local florists and flower shops to offer same day delivery. You will find budget sympathy flowers in Passaic here. Our funeral flowers are cheap in price but not in value.